Arthritis in the GSD affects millions of dogs worldwide. Many German Shepherds develop some form of joint disease during their lives. It might be mild, or even unnoticeable to the dogs owner. Or, at the other extreme, it could be debilitating to your pet, even severely affecting the dog's quality of life. Possibly even causing complete lameness. The majority of dog arthritis cases seem to fall somewhere in between the two extremes. 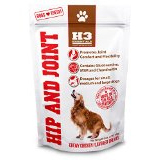 Medical management of arthritis in the German Shepherd is indicated for both young and for older dogs. Due to the high cost involved with many types of surgeries, medical management is oftentimes the only realistic option for many pet owners. For most GSD's, a veterinarian will begin with the first recommendations and work their way down as needed to control the pain and inflammation associated with degenerative joint disease. Management of arthritis in the GSD may require any combination of the following: weight management, exercise, warmth and good sleeping areas, massage and physical therapy, making daily activities less painful, anti-inflammatory drugs, and supplements. 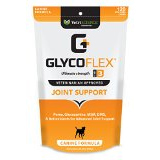 There are other alternatives as well, such as: Glucosamine and Chondroitin, Adequan injections, Rimadyl, Buffered Aspirin, Corticosteroids, vitamin C and surgery. It is never easy to see a beloved pet and friend in pain. There is not yet a cure for this debilitating disease but there is much you can do to control the pain, to make your German Shepherd more comfortable, and perhaps slow down the progression of the dogs symptoms when arthritis in the GSD is diagnosed. 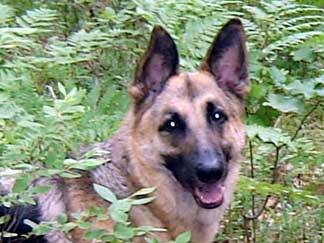 Each GSD with arthritis will need to have a program specifically designed for his / her own needs. What helps one GSD with arthritis may not help another. Work with your veterinarian so that you and your doctor can determine what is best for your German Shepherd. Arthritis in the GSD and its treatment can easily change over time. It is very important to realize that the program may need to be changed as your GSD ages, or if its symptoms improve. 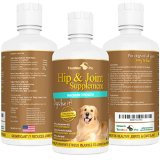 Below are a few alternatives to help treat arthritis and other joint diseases in the German Shepherd that we highly recommend to our readers for treating arthritis in their own pet GSD's. 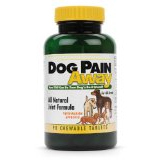 We use a few of them with our 11 year old German Shepherd and it has helped her tremendously. She used to stumble quite a bit and was beginning to have a hard time getting around but now seems to have much better balance and is much more puppy-like and playful since we started giving her supplements.